The Victorinox 2008 Soldier Knife is a solid, capable tool. Tools include a one-handed serrated locking blade, a Phillips screwdriver, a can opener, a small screwdriver, a bottle opener, a large locking screwdriver which is also intended to be used as a prying tool, a wire stripper, a reamer, a key ring, and a wood saw. The tool comes in Victorinox’s 111mm format, its largest offering. This allows for a generous wood saw and main blade. The blade combines serrations and a straight edge. About 60% of the blade is serrated, with the straight edge section being located away from the tip, closer to the handle where serrations are usually found in other combo edge knives. This is actually the best layout for a combo edge knife, given that the serrations work best for slicing through tough materials while the straight edge works best for push cutting. Given that pushing further away from the handle increases the distance therefore the force needed to cut, this disposition makes better use of both type of edges. 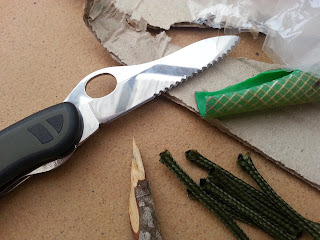 The Soldier Knife managed to cut various materials without a problem. I found the Victorinox 2008 Soldier knife to be a solid, practical cutting tool which includes the basic tools needed for its general purpose/utility role. 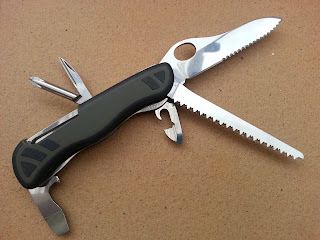 The serrations may not be as convenient at times as a straight edge but it will certainly take abuse better and be able to cut for longer periods of time, especially when in the hands of someone that doesn’t know how to properly sharpen a knife, which is the case of most people in general, including soldiers. The knife desperately needs a pocket clip. It is light enough to travel in a pocket but the clip would make it so much more convenient. Given that this is a soldier knife I would have liked to see more of a narrow tip capable of better penetration, both for cutting and if used as weapon. Another tool with a metal saw and file combination would have been nice. The same goes for making better use of the scales by adding tweezers and a pen. These would have been of use no doubt for a soldier. Overall it’s a quality, reliable tool by Victorinox which can be great with a couple personal mods or if Victorinox decides to fix these issues for future versions of this knife. You can get this knife with an all straight blade. You have to look a bit, but it is out there. These straight blade knives of Victorinox. I do believe that Victorinox India makes perfect Swiss army knives, multitools and other kitchen knives.